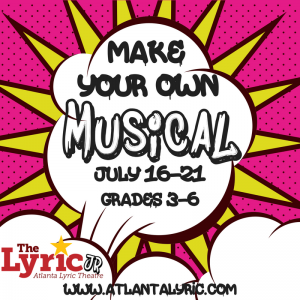 Per­for­mances will be the Sat­ur­day after the camp at the Lyric Stu­dio at 3:00 PM. Designed espe­cial­ly for stu­dents in grades 3 – 6, this week long the­atre camp will have par­tic­i­pants telling their own sto­ry! Stu­dents will cre­ate their own orig­i­nal skits and scenes through guid­ed improv activ­i­ties and games as well as write their own ver­sions of Broad­way and Pop music’s top hits-all cul­mi­nat­ing in a ful­ly real­ized orig­i­nal musi­cal about them! This camp focus­es on ensem­ble build­ing through group activ­i­ties, vocal and move­ment per­for­mance, con­fi­dence build­ing and com­mu­ni­ca­tion as well as fine tun­ing and build­ing on a sol­id musi­cal the­atre skill set! Per­for­mances will be the Sat­ur­day after the camp at the Lyric Stu­dio at 7:00 PM. 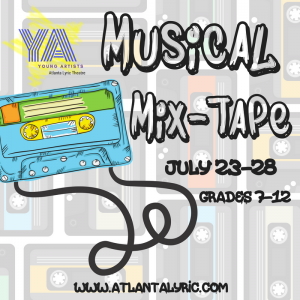 Our lat­est offer­ing in our Young Artists con­ser­va­to­ry series for teens, MUSICAL MIX TAPE takes stu­dents through their favorite Broad­way hits. In this week long inten­sive, stu­dents will cre­ate their own orig­i­nal musi­cal revue using their favorite broad­way tunes and sto­ries cul­mi­nat­ing in an awe­some per­for­mance fea­tur­ing orig­i­nal chore­og­ra­phy, pow­er­ful vocal per­for­mances and great scene work! This camp focus­es on fine tun­ing musi­cal the­atre skills, like vocal and move­ment pefor­mance, as well as a strong act­ing foun­da­tion. The camp is based in ensem­ble build­ing through group cre­ation, com­mu­ni­ca­tion skills, self aware­ness and con­fi­dence build­ing.